Intro Note: Well, this must be my slowest post from initial creation to actually getting it finished for publishing. I started in early April and then life sort of got in the way. It’s now mid-June as I finish it off. The opening sentence below seems a bit dated now! After travelling to Sydney in early February with my new to me 10-17mm fisheye zoom (see Fun with a Fisheye), I was back in Sydney a few weeks later for four days of business related meetings and conferences. One evening I loaded up the camera gear and set off for a walk past Circular Quay, under the Sydney Harbor Bridge, and then back down the other of the Harbour Bridge expressway to my target destination for the evening, Observatory Hill. The area I walked through is known as The Rocks and is a significant heritage area with most of the properties there dating from the mid to late 19th century. After a short walk from my hotel, I arrived at Circular Quay. This is a very well known spot on the edge of Sydney Harbour where all of the Sydney ferries arrive and depart from the central business district. The Sydney Opera House is on one side and the Overseas Passenger Terminal on the other. February/March is peak season for cruise liners to be visiting Sydney and I’m up in Sydney for the same week at the beginning of March each year. 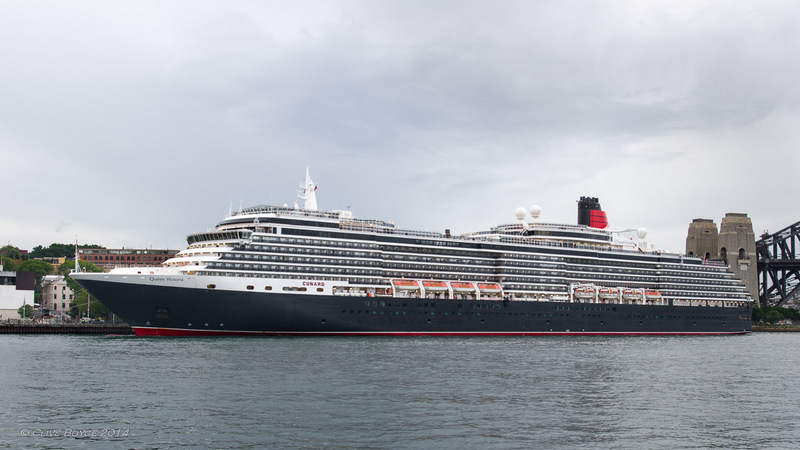 Typically one of the Cunard ‘Queens’ calls into Sydney during that week. This year it was the Queen Victoria. Previously I’ve seen the Queen Mary II and the now retired Queen Elizabeth II. As yet, I don’t think I’ve yet laid eyes on the new Queen Elizabeth. What I like about the Queens is that they more or less preserve the classic lines of the trans-Atlantic liners. They might just be ships, but the lines are graceful and sweeping. The design language is cohesive and everything is in proportion. Whereas the look of some of the modern cruise ships just leaves me cold. Ugly and sometimes kitsch are two descriptors that spring to mind. So, I’ll start this post with a few Queen Victoria shots, but I promise this is not a ship only post and I will be moving onto other subjects. Queen Victoria under a dull and somewhat threatening grey sky. On this evening the rain held off. By way of contrast, two years earlier I photographed the Queen Mary II on her March visit, also in the early evening. Just after finishing those shots, it started to rain. And rain, and rain. It stopped the next day at noon after 4½ inches had fallen. This entry was posted in Australia, Boats and Shipping, New South Wales, Other States, Places to Visit and tagged Circular Quay, Night Photography, Observatory Hill, Photography, places to visit, Queen Victoria, Sydney, Sydney Harbour, Sydney Harbour Bridge, The Rocks, tourist attraction on April 3, 2014 by aussiesouthlander. I had a mild attack of lens buying addiction a few weeks back, succumbing to a couple of temptations listed on Ebay. One of these was a Pentax DA 10-17mm F3.5-4.5 fisheye zoom. I wouldn’t normally spend a lot of time introducing a lens, but I will on this occasion as the DA 10-17 is quite unique. At the 10mm end of its zoom range, the lens is quite ‘fishy’ in character with a 180º field of view across the diagonal of the frame. But at the 17mm end, it is much more rectilinear (‘normal’) in character, and what distortion there is can be substantially reduced using computer software should you wish to do so. This makes the lens quite a bit of fun as the act of zooming in or out also dials up or down the degree of fishy-ness. With fisheye lens, placement of subject matter can also impact upon the apparent fishy-ness of an image, so between zooming and subject placement quite a range of creative outcomes can be generated from a single scene. it focuses amazingly closely, like to within an inch or so of the rather large and protruding front element. It allows a surprisingly amount of selective focus from an ultra-wide lens. On the negative side of the ledger, the DA 10-17 can be prone to purple fringing on high contrast edges, but my experience to date is that this readily cleans up in Lightroom or similar software in most cases. The lens arrived in the post just a day before I was off to Sydney for a weekend away, so my first use of the lens is also something of a documentary of my Saturday in Sydney. On most of the rare occasions I get up early to photograph sunrises, Murphy’s Law kicks in and the dawn fails to produce the goods – no cloud, too much cloud, whatever. So my general modus operandi is that I only get up early to catch planes. But occasionally I’ve been lucky, and on the Saturday morning, the act of being up early to catch the first flight to Sydney coincided with a really good dawn, just by dumb luck. 17mm, F5, distortion corrected in Adobe Lightroom. Some cropping and mucking about to remove a few annoying window reflections. Use of distortion correction software will stretch the outer portions of an image (as also does optical correction within a lens). You can see that demonstrated with the somewhat elongated fuselage of the second 737-800 to the right. First shot of the day and one of my favorites from recent shooting. 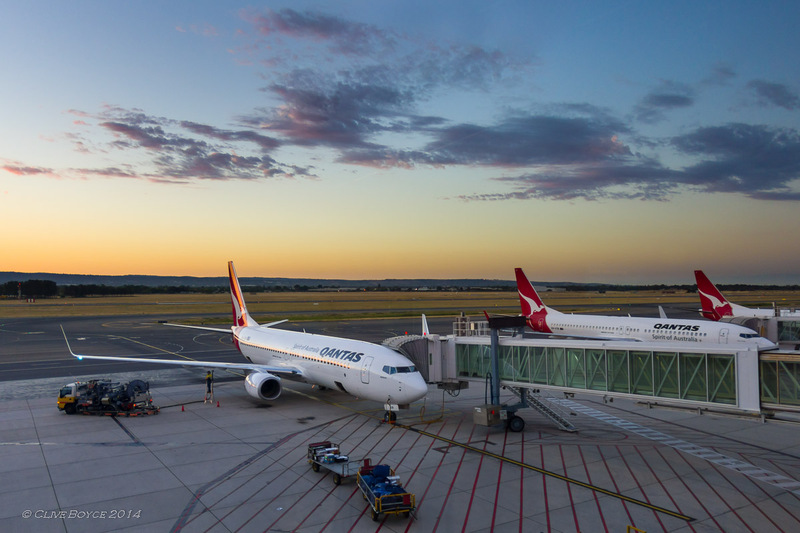 This entry was posted in Australia, Gear Reviews, New South Wales, Other States, Places to Visit and tagged Adelaide Airport, Fisheye lens, Lane Cove, New South Wales, Pentax DA 10-17 zoom, Photography, places to visit, Sydney on February 26, 2014 by aussiesouthlander.